Photo by Pezibear via Pixabay (2016); photo edited and text added by Erin Franco. We had our new home enthroned to the Sacred Heart of Jesus a couple of weeks ago. It was a such a wonderful and special moment for my family. Especially for me. So what does it mean to have your home “enthroned”? It’s a funny-sounding term that basically means that your family formally invites Christ to come into your hearts and home. You recognize Jesus as your King, friend and brother in your home, and you display an image of the Sacred Heart somewhere in your house to help remind your family of Christ’s presence in your home. There is a special novena to pray as a family before the big day, and a beautiful prayer service on the day of the enthronement. The origin of devotion to the Sacred Heart goes back to St. Margaret Mary Alacoque. In 1673, Jesus appeared to her in a vision. He showed St. Margaret Mary an image of His Sacred Heart on fire and surrounded by a crown of thorns. He told her that the flames represented His love for humanity, and the thorns represented man’s sinfulness and ingratitude. Jesus told her that her special mission was to establish the devotion to His Most Sacred Heart, and He revealed twelve promises that He would bestow upon all those who invited Him into their lives in this special way. Of course He does. If we ask Him. Enthroning the Sacred Heart in your home is an intentional, meaningful, unifying way for your family to take living out faith in the home seriously. 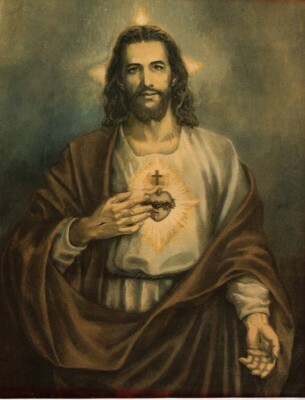 Putting up that special image of the Sacred Heart prominently in your house is an ongoing visual reminder to walk the walk day-in and day-out, and to ask Him for what we need–for blessing, for prosperity, for grace to be peacemakers in the home, for an increase in faith, for consolation in troubles, for graces to navigate the often-messy moments of daily life. One thing I love about the Catholic faith is that there are so many things that remind us to have a constant, intentional conversion back to Christ. One tradition of our faith that is a great example of that is displaying meaningful religious art in the home. When I spot the beautiful ceramic statue of Our Lady tenderly holding baby Jesus, I am reminded to be tender with my own children–and sometimes it makes it a little easier to hold my temper. When I see the icon of the Holy Family on my living room wall, I am inspired to keep striving for my part to love my own holy family as best I can–instead of giving into disenchantment with a tough morning of messy family life. So, after living with my parents for two years, we finally bought a home of our own again right before Thanksgiving. (And yes, we are loving, loving, loving it!) 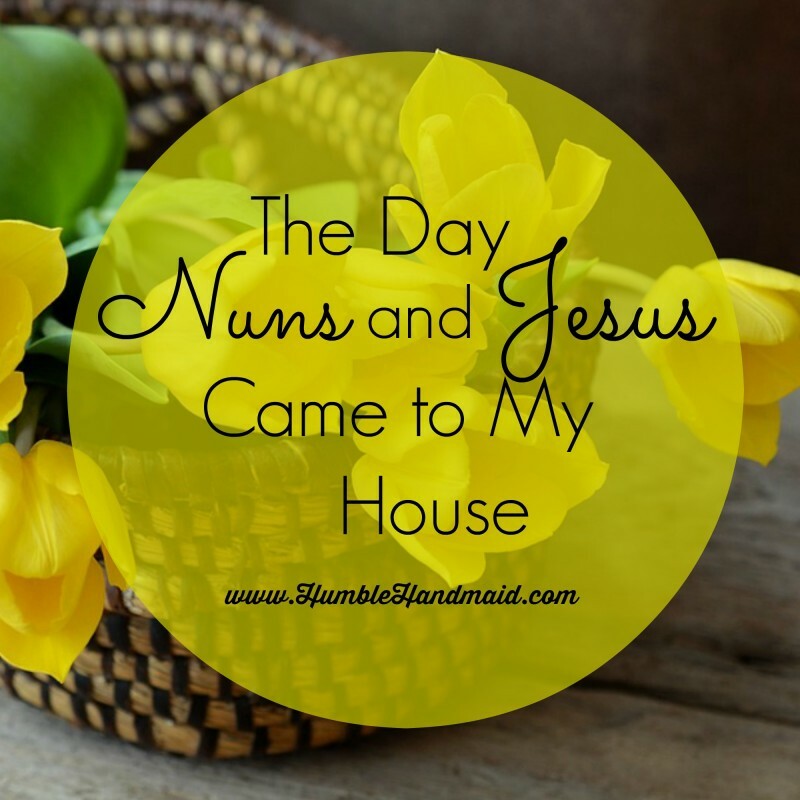 Well, after we moved into the new house, my friend Sr. Krista started asking me each time she saw me if we were planning to have our home enthroned to the Sacred Heart. I told her that Michael and I planned to, but hadn’t scheduled anything yet. (Because Moving and The Holidays and First Trimester…you get the picture.) Finally, one day Sr. Krista shyly told me that as soon as we scheduled it, she’d love if I’d let her know, because she and the sisters wanted to attend the ceremony if possible. Not only did Sr. Krista’s gentle encouragement and excitement for us help us plan our home enthronement, but our dear friend Fr. Matthew Graham was thrilled to bits when we asked if he would do his very first enthronement and house blessing for us (he has been a priest for just under a year now and is our Domestic Church circle priest, so he’s been through a lot with us). To top it all off, Fr. Matthew asked us if he could celebrate a votive mass for us in our home before the ceremony. Ya’ll, it was such a special day for me. I know it was for Michael as well. It just meant so much more than I can put into words. 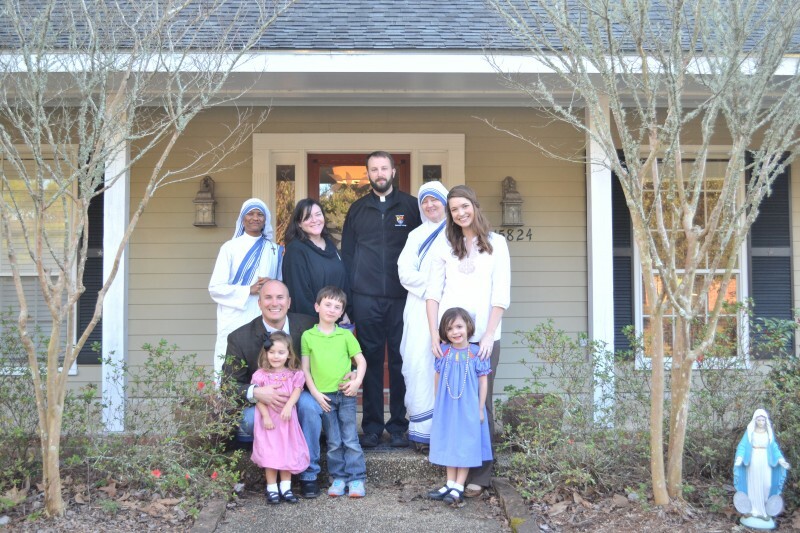 The fact that our enthronment was marked with such special guests–and with the huge honor and joy of having mass and the Blessed Sacrament in our home–felt sort of like God gift-wrapping the blessing of our house with solid gold and jewel wrapping paper. At least that’s how I see it. :) Our new home is a whopper of a happy ending to a hard part of Michael and I’s life story. It is a witness to me–and I hope so much to many of our family and friends–of how God can work things out in surprisingly generous ways in His timing and mercy. No, God isn’t always going to wrap up difficult things in life with jeweled ribbons and sunshine and beautiful nuns, but maybe the point is that if it is best for our own soul or the soul of another, He can.